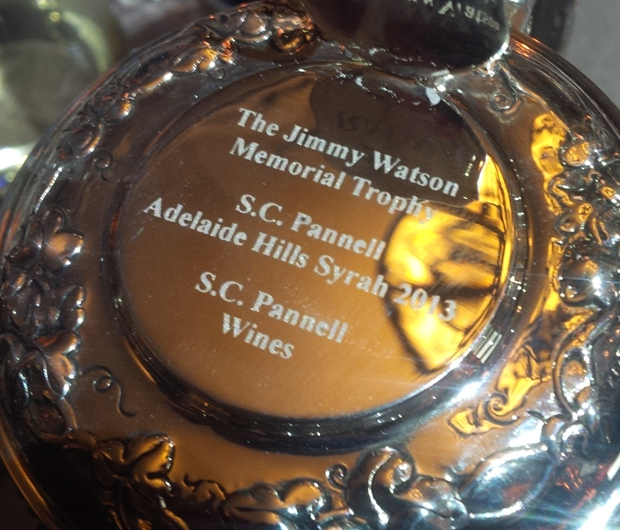 In a return to South Australia after an absence of 7 years, and on its first ever visit to the Adelaide Hills, the renowned James Watson Memorial Trophy (Jimmy Watson) has been awarded to SC Pannell Wines 2013 Adelaide Hills Syrah. Widely regarded as Australia’s most significant wine show award, and perhaps the only Australian domestic trophy capable of attracting serious international interest and exposure, the Jimmy Watson is awarded to the best red wine of show at the annual Royal Agricultural Society of Victoria’s Melbourne Wine Show. Stephen Pannell, who had previously won the award in 1996 during his tenure at Hardy’s as chief red winemaker, was understandably delighted with the result: “Winning the Jimmy Watson Trophy is a huge honour, and a great acknowledgement for the first ten years of hard work for all of the SC Pannell Wines team. With the market recently moving away from the fuller-bodied styles of wine that typically thrive in warmer climates – and having found favour in the past two years with Tasmanian Shiraz and Mornington Peninsula Pinot Noir respectively – it had been widely speculated that Australia’s most famous wine trophy had ‘done-its-dash’ with South Australia. “I just try to create wines that suit our climate and way of life – wines to drink with the food we grow, make and eat in Australia. That is really the opportunity we see, and why we have just opened our first cellar door. Now I hope people come in to check out the new Jimmy!” Pannell concluded. Click here to read about our online ordering policies.